Revealed, Common Scottish Words And Phrases You Never Even Knew Existed! each word makes. Braw, don't you think? Don't you love words in all their simplicity, complexity and down-right beauty, often conveying over the length of a sentence or two an avalanche of mental imagery and complex emotion. But it's not just the meaning and the context of words which is important but the sound they actually make, too. Here in Scotland we're lucky in that as well as the Queen's English being spoken widely, we also have great variety in the number of dialects you can hear as you travel across the land. Indeed, words which mean one thing in a town or city can have a completely different meaning only a few miles away. But all of that just adds to the richness of the phonetic tapestry. Here's a good word to get your teeth around, drookit, as in 'drookit dug'. Think drowned rat and you come somewhere close to the meaning. Personally, I love the word. Speak it slowly and at the same time picture in your mind's eye a wet, shaggy dog clambering up a river bank and frantically shaking the water out of its fur, soaking everyone within spitting distance at the same time. That's a drookit dug! 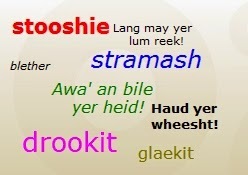 Stooshie, stramash, rammy, three Scots words which essentially mean the same thing, a strong disagreement, argument, or even a physical fight. But don't they all convey a sense of drama, movement, confrontation or even a slightly anarchic feeling? They certainly do for me. Another favourite is blether, as in chat or talk. Blether, along with blethering, makes me think of a couple of old friends having a relaxing conversation, perhaps with a cup of tea, or something stronger, in their hands, each enjoying the other's company. It's a friendly, intimate sort of word. Of course, in a completely different context, a blether can mean a gossip, or someone who talks a load of rubbish. There's something about the sound of the word glaekit which perfectly describes someone who is foolish or stupid. I find you simply don't need to add anything else to adequately convey its meaning. It's one of these economically descriptive words often found in day-to-day conversation here in Scotland. If anything, the URL of this website, the Scottish vernacular for window (windae, as in 'winday'), has certainly been the inspiration for this post. I love the phrase, 'Yer bum's oot the windae! ', which is another way of saying your talking a load of rubbish. It's got a kind of earthy sort of feel to it, don't you think? Another of my favourite phrases is 'Awa' an bile yer heid!' or, put another way, 'Please go away and boil your head.' Kind of charming, no? It's a colourful way of saying get lost. 'Haud yer wheesht!' is a Scottish phrase that's up there with the best of them, exhibiting the sort of sonic quality which'll end even the most vociferous of arguments! Finally, 'Lang may yer lum reek!' is a peculiarly Scottish way of saying I wish you good health and continued good fortune. Lum is simply the Scots word for chimney, reek is the strong smell given off as smoke belches out of it, and lang means long. In other words, long may your chimney give off a strong,unpleasant smoky smell, indicating you're well enough off to afford to burn coal or some other fuel to keep warm. There you have it, just a very few of the many words and phrases used every day in Scotland which visitors can sometimes find a trifle perplexing. What about explaining some of the common words and phrases to be found in your neck of the woods? Tell me about them!